Special thanks to the collaboration of Ricardo García Bahamonde. It has already been evidenced that, during the last years, citizens are increasingly transferring responsibility towards companies. People want them to solve real problems and contribute to build the world that consumers imagine with the resources available. As the Authentic Brands study reveals, the world is moving from the “responsible consumer” to the “coherent citizen” model; this citizen, a more conscious one, sees the act of consuming as “not only a financial transaction, but an interaction in which personal principles increasingly influence the consumption choice”. According to data presented by Luis Miguel Barral, co-founder of Two Much, “35% of people in Spain lean towards purchasing a product if they feel that the values of the brand are closer to their own ones” while “50% of the population may consume a brand or not depending on whether it is according to its principles or not”. This behavior, in addition, is repeated across all age ranges. How to satisfy this “coherent citizen”? Many CSR programs are to short-term oriented and mainly focus on reducing risks and obtaining good corporate reputation returns. The underlying disconnect with the organization’s core business is reflected in these programs being frequently handled in an isolated manner by non-commercial departments. In addition, this vision of CSR perceives any action as a cost and not as an investment for the company. None of the social problems addressed with the support of certain organizations are either no really solved, or solved in an inefficient way, since the priority is to comply with administrative requirements to be labeled as a “socially responsible company”. Relevant actors have changed: not only new consumers, but also employees, partners, suppliers and local citizens bring to the table a series of very different expectations and demand positive and measurable results in the medium and long term. Most organizations or projects supported by CSR programs rely on external funding to operate. In addition, these initiatives often do not generate a return on investment for the company (again, this reinforces that the CSR program is perceived as an expense and not as an investment). As a consequence, the sustainability of these organizations is clearly affected by any modification or reduction in the CSR programs and many of them are forced to disappear or significantly reduce their positive impact on society. In order to meet the citizens’ new expectations and truly connect with consumers at a deeper level, companies are compelled to transcend the traditional paradigm of Corporate Social Responsibility and show a broader vision in their value creating strategy. The key of this resides in redefining social commitment through the creation of shared value. In other words, the company must be able to generate economic value in a way that it also produces value for society by responding to its main challenges. Unlike many of the CSR programs (which normally “run” in parallel with the commercial and production processes), this approach implies that social and human value is directly integrated into the company’s core business processes through the design and execution of their business models. Thus, more and more financial institutions and investors show an interest in operating with those companies and new entrepreneurship projects that can prove they can create measurable social and environmental impacts, as well financial returns, through a more sustainable long-term business strategy. Following this trend, in 2014 the World Economic Forum launched the Global Agenda Council on Social Innovation, providing a definition of Corporate Social Innovation based on the proactive design of new business models with shared value exchanges. However, it is also true that many of these organizations are facing challenges when seeking efficient ways of implementing this concept of shared value and, by way of it, achieving new forms of competitive advantage. Image describing the need to learn to collaborate with many more people to create projects with shared value through social innovation. Source: Summer School on social innovation held in Vancouver, Canada, # SIXVan14. Corporations are struggling to understand how to internally streamline co-creation, as these processes require a shift in the way they think about their operations and strategy. New skillsets must be developed and a new thinking must be adopted in order to observe business development processes as a holistic construction process, and not just a silo within the company. This implies broader interactions between the company and the communities in which it operates. It also means not only concern about the needs and experiences of the people who will use their services and products, but also the needs and expectations of all those stakeholders that influence the experiences of those clients or beneficiaries, who are involved or are affected by the activities of the company (e.g. employees, vendors, distributors, social and environmental organizations, government, etc.). 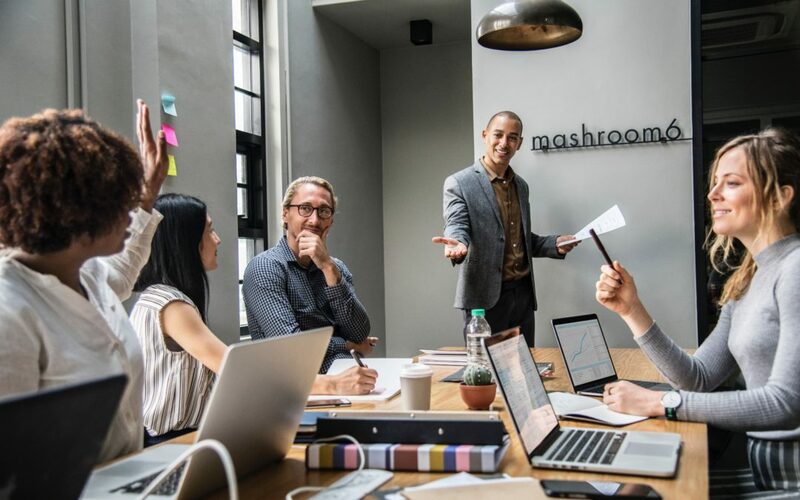 In other words, in order to benefit all members of a community, a company must be able to bring together “in the same room” a variety of opinions and channel the result of the co-creation process towards the company’s operational processes in an efficient and agile manner. Applying co-creation methodologies while designing a business model involves imagining an inclusive value network which benefits all participants in a community or innovation ecosystem. 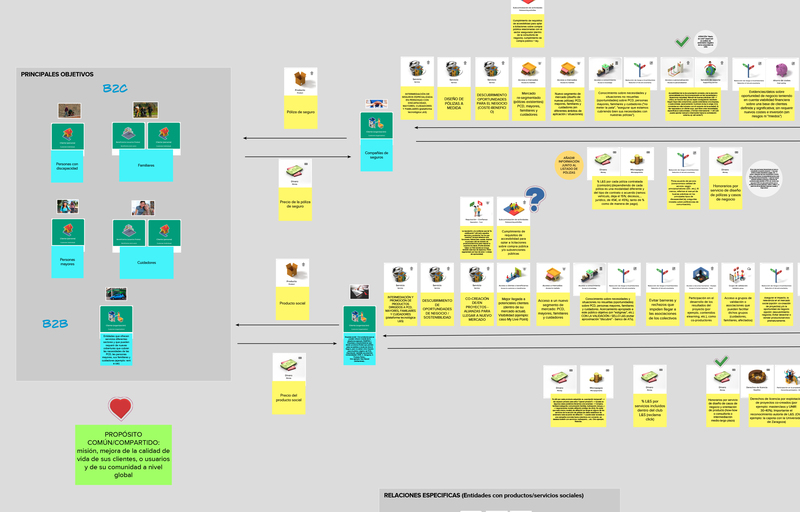 Snippet of the “Free and Safe” Project inclusive value network, designed with theBusiness4ALL co-creation tool. Although there are still few companies that are being able to extract the full potential of co-creation methodologies, it is worth highlighting some examples. Barclays Bank uses accessible technologies to make its banking services and products easier to use by everyone, including the elderly and people with disabilities. The purpose driving Barclays Bank’s Corporate Social Innovation is to become the most accessible financial institution in the FTSE 100 (the London Stock Exchange index benchmark). High visibility credit card for easy use by clients with low vision. Brazilian company Natura, producer and distributor of cosmetics and personal hygiene products in Latin America and France, maintains numerous corporate social innovation initiatives aimed at preserving the biodiversity and the cultural heritage of the Amazon region and placing such a purpose in the value proposal offered to its clients. Poster of the “Floresta em Pé” initiative of the Brazilian company Natura to stimulate collaboration with entrepreneurs and social startups that are creating a positive socio-environmental impact on the Amazon. In Spain, Hermanos Aragón Corvera Correduría de Seguros, an insurance brokerage company, has actively worked in recent years with non-profits, local and regional government agencies, insurance industry companies, social entrepreneurs and universities to design the Libre y Seguro (Free and Safe) Project, a technological platform under development aimed at helping large insurance companies easily re-segment their offering of products to the elderly, people with disabilities, relatives and caregivers. Through the Free and Safe platform, insurance companies will be able to add a strong social purpose as differentiation in their value proposition: in addition to promoting equal access, independence and quality of life opportunities for the aforementioned groups, they are contributing to strengthen the sustainability of non-profits that work with these groups at local scale. The Free and Safe project symbol. Strong buy-in and commitment from the top management. A clearly defined shared purpose. Identify and define main needs and pressure points (functional, social and emotional) of all actors within the community that play a role in creating or delivering the product or service. Involve both external interest groups, key people and social entrepreneurs, and employees in the co-creation process, leveraging the talent and commitment of those with an intrapreneurial profile. Experiment and learn in an agile and iterative way, starting with small projects and progressively scaling them. Measure the created shared value (to better comprehend the task and challenges surrounding this crucial issue you can read the guide Shared Value Measurementcompiled by Andrew Hamilton and Phil Preston). Accommodate the co-creation process to all the capabilities and abilities of the participants. Gradually create an innovation-focused structure in accordance to the company’s context, resources and culture, that favors the organic and sustainable development of a Community of Shared Business Interests. Without a doubt, Corporate Social Innovation will become a huge opportunity for those companies capable of leveraging it. Likewise, co-creation methodologies will certainly not be suitable for those too resistant to innovation or reluctant to move out of their “comfort zones” (actually, areas of instability) located inside “traditional” organizational processes. Listening to more people also requires an extra dose of empathy and openness not always present. But, above all, co-creating shared value requires the use of more inclusive business tools, which allow to effectively manage the diversity inherent in the sense of community of this new socially responsible company. 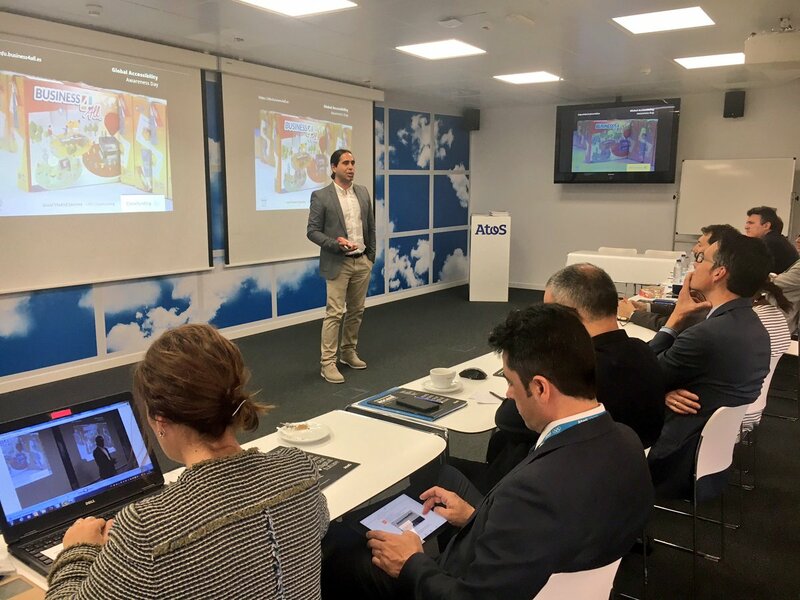 In other words, we cannot adequately channel the human experience of all participants into the company’s business processes unless we use the right instruments needed to support the co-creation process. Interested in social innovation? Learn more at Social Innovation Academy – the first fully online management training programme focusing exclusively on social innovation. Why Social Innovation Academy? Social Innovation has been increasingly perceived as the answer to the rising number of European societal challenges. While the European authorities, leading academics, policy experts, business people and activists agree that social innovation is the key to better future for Europe and the world, it is extremely difficult for professionals to obtain high quality training on what social innovation actually offers and, more importantly, how it can be done in practice. Social Innovation Academy aims to change this situation in Europe and beyond. Jaisiel Madrid Sánchez. I am the founder of Closefunding, a Spanish consulting organization which aims to promote business innovation, entrepreneurship training and R&D projects from the impact sector. A proud friend of Social Innovation Academy, I am also the inventor of Business4ALL®, a toolset to make business modeling creating social change. This tool is also used to foster more inclusive interactions among all participants in social innovation and entrepreneurship initiatives. I am mentor and advisor in several European projects and non-profit organizations. Prior to this, I was the leader of R&D Department of ILUNION Accessibility, Studies and Projects, the ICT company of ONCE Foundation, participating in international projects on e-Inclusion, healthy ageing and inlcusive social innovation. I was also the technical coordinator of INREDIS project, the largest Spanish R&D Consortium in Spain with focus on accessibility, and one of the founders of the Spanish University Network for Innovation on Accessible and Interoperable Technologies. I have also co-organized several sessions on “Assistive Machine Learning for People with Disabilities” in some of the world’s top conferences for machine learning professionals. Social Innovation Academy event in Ljubljana attracted inspiring speakers. Participants presented their social innovations along with other exciting news!